Earlier this week, Altair Semiconductor announced that they had completed a demonstration of the company's TD-LTE chipset for executives of China Mobile. AsiaTelco Technologies integrated the chipset into a USB dongle for Altair. Although conditions of the setup were not described, Altair claimed download speeds of more than 50Mbps and upload speeds of more than 18Mbps during the demo, which was held during a board meeting of the Next Generation Mobile Network Alliance. Altair said that they had previously demonstrated their TD-LTE solution in India and Japan, and had completed several months of testing with China Mobile prior to last week's demo. "Our partnership with Altair has provided us with the ability to offer LTE products to the market well ahead of our competition.."
The Altair announcement raises the question of whether they have taken over the lead from Sequans for China Mobile's TD-LTE business. 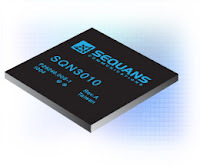 One year ago, Sequans announced their own TD-LTE demonstration of USB dongles for China Mobile, at the World Expo 2010 in Shanghai. The USB dongles used for the demo are powered by Sequans’ SQN3010 baseband SOC. The chip is designed to comply with the 3GPP R8 standard, supporting UE category 3 throughput of 100 Mbps in a 20 MHz channel, and LTE band classes 38 and 40. Alcatel-Lucent and Motorola also collaborated with Sequans for the World Expo demonstration network. Sequans has also announced collaborations with other leading LTE infrastructure equipment suppliers, including Ericsson, Huawei, and Nokia Siemens Networks. Related article: Altair Semiconductor - Last (base)Band Standing?